To begin, the name — Death Valley National Park — doesn’t immediately conjure visions of a lively holiday. And you’ve heard: It’s the lowest, driest, hottest place on earth. All true. But here, in one of the world’s most dramatic desert landscapes — a place of shifting sand dunes, multi-hued rock formations, and hidden canyons — you’ll wake before dawn to watch the rugged mountains turn pink with the sunrise. Then, come nightfall, you’ll marvel at star-filled skies as the desert wind rustles the palms. And you’ll wonder why it took so long to find your way here. Death Valley has earned its “dry” reputation thanks to an average annual precipitation of fewer than 2 inches. In fact, no rain fell at all in 1929 or 1953. Yet, Death Valley is full of life. From autumn into spring, the weather is positively heavenly. The occasional winter rainstorm ushers in vast fields of wildflowers. And a remarkable range of creatures, both great and small, have either adapted to summer’s harsh conditions or find refuge in the area’s diverse habitats. Not merely barren desert, the park also encompasses spring-fed natural oases, pinyon-juniper woodlands and even pine forests. With so much to see and do, the intrepid explorer should determine a base camp. Just a stone’s throw from the national park visitor center, The Oasis at Death Valley, comprised of the historic Four Diamond Inn at Death Valley and The Ranch at Death Valley, provides a well-situated solution with unexpected luxury. It’s a true oasis-like setting, with modern accommodations, fine dining and spring-fed pools, a welcome contrast to a day spent exploring salt flats, mud hills and volcanic craters. 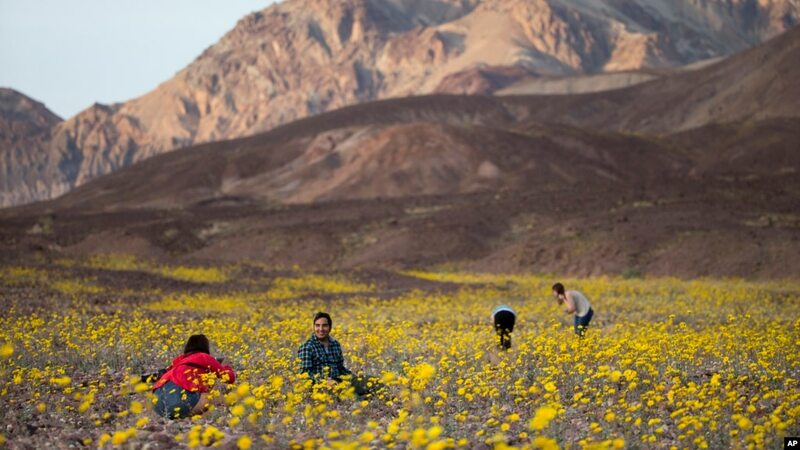 Many Death Valley National Park visitors venture to this remote region 120 miles northwest of Las Vegas to marvel at the stark desert beauty and escape into the beautiful silence of the park’s vast expanses. But given that it is the land of stark contrast, why not create your own itinerary with a nod to the exotic landscape? Mix in a massage under the Oasis’s date palms with a summit of the Mesquite Flats Sand Dunes. And pair a soak in the Inn’s healing waters with a mountain bike ride out Skidoo Road. Follow a jeep tour to a ghost town and enjoy a glass of fine wine, sipped al fresco on the terrace, as the sun sets in the valley below. You get the idea. After the 1848 discovery of gold in California, the valley experienced more than a century-long mining boom. Most pioneers set out on a quest for gold and silver but were met with a notable lack of success. The only long-term profitable ore to be found in the region was borax, which was transported out of Death Valley with the famous 20-mule teams. Today visitors can explore the once bustling towns of Chloride City, Gold Point, Panamint City and Ballarat, among others. Peer into abandoned mines, and step inside the old saloons, post offices and abandoned houses and imagine what life must have been like for these hearty Westerners. Bring your A-game (and your camera) to the lowest golf course in the world, The Furnace Creek Golf Course at Death Valley, at 214 feet below sea level. The hazards here include coyotes that like to fetch golf balls (you are allowed a free drop) and the perplexing fact that balls don’t travel as far below sea level. Recent renovations on Death Valley’s 18-hole, par-70 course addressed water conservation and transitioned 15 acres of maintained turf to desert with low-water-use native plantings. But the improvements didn’t make the course any easier. So, should the top-rated links humble you, look forward to the smile-inducing, 19th-hole grill and bar, complete with a drive-through for golf carts. Remarkably, more than 400 animal species are native to the park, including dozens of reptiles, 51 different mammals and even six kinds of fish. You never know what you’ll see, so keep your eyes open for roadrunners zooming across the highway and coyotes feeding on fallen fruit in the date palm groves of the Inn at Death Valley. Most of the park’s animals are nocturnal, so venturing out at dawn or near sunset when animals are active is your best bet. The park’s scattered water sources, including Darwin Falls, draw a wide range of animals. Carry a small pair of wide-angle binoculars. When possible, choose a spot that offers a wide view and stay put. Back at the Inn, built on the grounds of a natural spring in 1927, a million gallons of fresh glacial water flow out of the ground daily. The naturally heated Travertine Springwater, a comfortable 84 degrees year-round, fills swimming pools at the resort and at the nearby Ranch at Furnace Creek. Because the water is continually replaced with fresh spring water, there’s no need to chemically treat the pools. 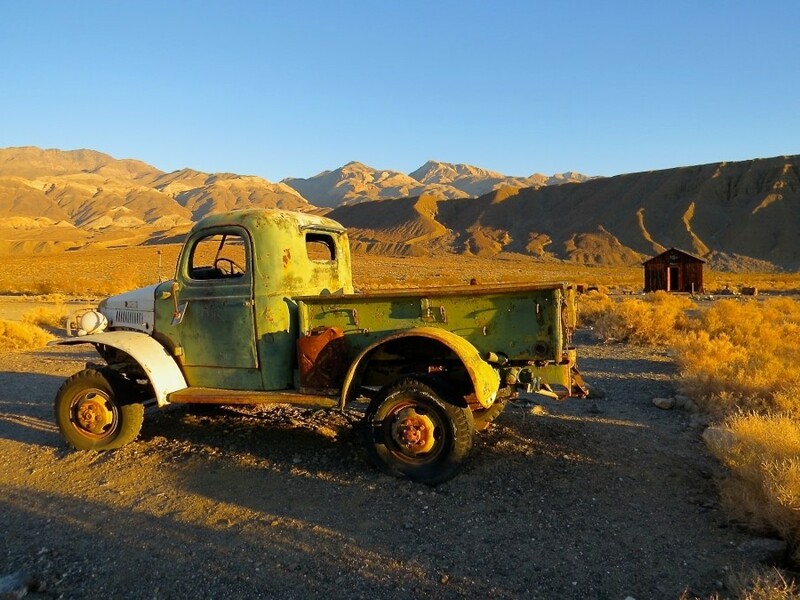 Rent a Jeep, load up, and learn about the local geological and mining history as you wind through Titus Canyon, a 27-mile-long gorge through the Grapevine Mountains. Expect door scraping narrows when you encounter rock walls — hundreds of feet tall and only 20 feet apart — before rising via ribbon-like switchbacks. Along the way you’ll see American Indian rock art and learn about the early miners, lured to the region by the prospect of riches. Stop by the National Park Service visitors center to learn about hikes within the park, for any fitness level. We love the colorful Mosaic Canyon and Badwater Basin salt flats, the lowest place in North America. Other options include an easy (albeit sandy and rocky), 1-mile round-trip up a canyon to Natural Bridge, the largest of the park’s natural bridges. Consider a hike along the rim of a volcanic crater just over an hour northwest of your base camp. Six hundred feet deep and a half-mile across, Ubehebe Crater looks like something you might find on the moon. It formed around 2,100 years ago as magma flowing upward from deep within the earth met pockets of groundwater, setting off a powerful volcanic steam eruption. Be sure to practice safe hiking (bring plenty of water) in this rugged terrain. Ranger-led hikes, such as the 7-mile Death Valley Paleontology Tour that leads to Pleistocene-era fossils, are also available in season. With hundreds of miles of both paved and dirt roads, road and mountain biking are popular within Death Valley National Park during the winter months. Visitors can bring their own or rent mountain bikes at the Inn or the Ranch. Either way, resort staff members can suggest tried-and-true scenic rides and safety tips. With its desert-clear air and miles-from-anywhere location, the expansive night sky at Death Valley is ablaze with stars. Because it has some of the darkest night skies in the country, it is designated a Gold Tier International Dark Sky Park, the highest level awarded. Don’t miss the ranger-led astronomy tours offered throughout winter. 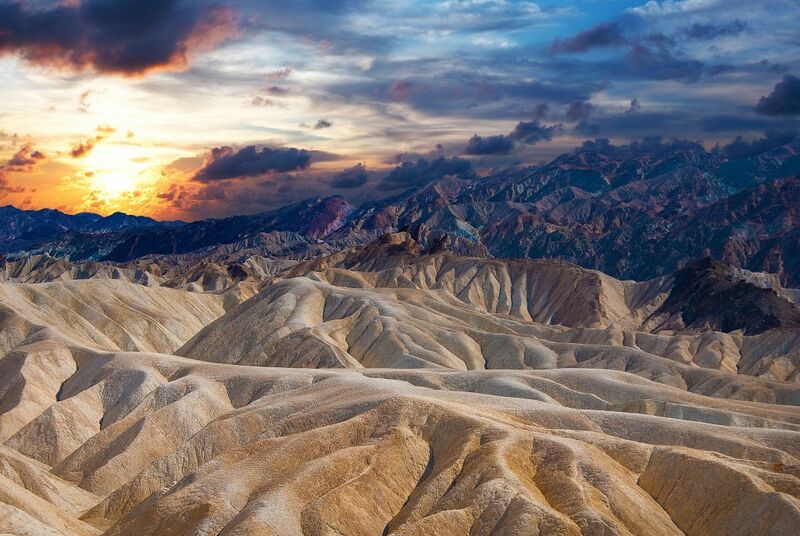 It’s been said that Death Valley National Park is like a different planet. Apparently, George Lucas agreed. Rather than attempt to create a galaxy far, far away, he chose to film both “Star Wars Episode IV: A New Hope” and “Star Wars Episode VI: Return of the Jedi” in the national park. Explore the otherworldly terrain that helped to inspire these classic films when you head to the Mesquite Flat Sand Dunes, Desolation Canyon, Golden Canyon, Dante’s View and Artist’s Palette to stand where Luke Skywalker contemplated the Force in 1977. The wildflower bloom demonstrates the life that springs forth from late fall and winter rains in this 3.3 million-acre park. Each year’s display varies with the intensity of the bloom and the timing of the flowers’ appearance. But it is not uncommon to see Desert Gold and Brown Eyed Evening Primrose or Notched Leaf Phacelia appear in mid-January or earlier. The full impact of the revitalization becomes most apparent between February and March but sometimes continues until June at higher elevations. Change doesn’t come quickly in Death Valley National Park. Geological time remains the standard, human impacts are minimal, and the landscape is seemingly eternal. The coyotes continue to howl on the flats, yet a resounding silence prevails. Once nourished by the vast, unexpected beauty and the startling contrasts, the change within will be yours to define. 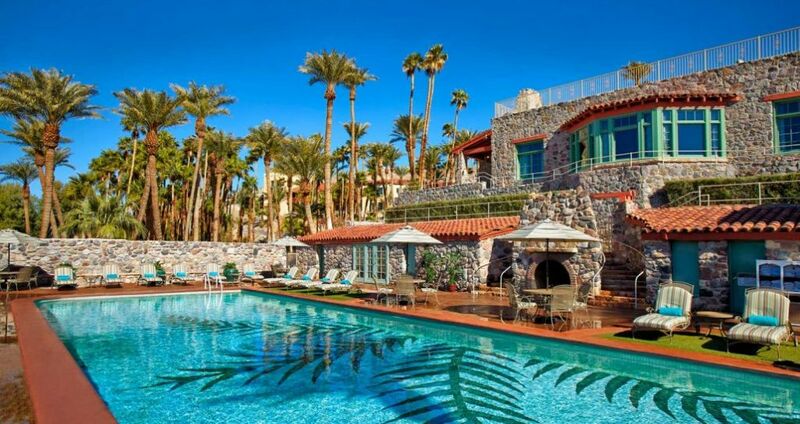 The Oasis at Death Valley (formerly Furnace Creek Resort) sits in a lush oasis surrounded by the vast and arid desert of Death Valley National Park, California —just 120 miles northwest of Las Vegas and 275 miles northeast of Los Angeles. The resort includes two hotels: the historic Four Diamond Inn at Death Valley, with 66 newly refurbished rooms and 22 all-new casitas and the more family-oriented, 224-room Ranch at Death Valley. Learn more at oasisatdeathvalley.com or call 844-236-7916. Blink and you’ll miss Buellton, Calif., a tiny town a two-hour drive north of Los Angeles. And maybe that’s just fine with Buellton, one of those undiscovered destinations where everyone expects you to stay a few exits south, in touristy Santa Barbara, or just keep driving through to nearby Hearst Castle. But, if you pull over, you’ll discover a place with a series of quirky, fascinating attractions that take a nice picture and a tasty, if not unexpected, cross-cultural experience. I have to admit, Buellton’s presence was jarring to me when I drove south on California Highway 101. When I was a college student in Southern California, this town technically didn’t really exist. It wasn’t incorporated until 1992, a few years after I graduated. If you’re still having trouble placing it on the map, then think Pea Soup Andersen’s, the iconic roadside restaurant known for its split-pea soup. That’swhere Buellton is. Just across the street from Andersen’s is the new Sideways Inn, named after the cult film shot right here. It’s part of a sprawling Flying Flags RV Resort, with its rows upon rows of impressive land yachts. Buellton definitely has a road theme going on. Across the old 101, which runs parallel to the current 101 and right next to Flying Flags, you’ll find the Mendenhall’s Museum, a private collection available by appointment only. You can tour its vast collection of gasoline pumps, globes and road signs. Mark and Vickie Mendenhall, the museum’s curators, live on the property and personally give all the tours. I was particularly impressed with their California license plate collection that goes back almost a century and tells the state’s automotive history. You can easily identify plates issued during the world wars, as well as the state’s evolving self-image, from agriculturally-focused to the diverse place it is today. One of the best parts of Buellton is its central location. 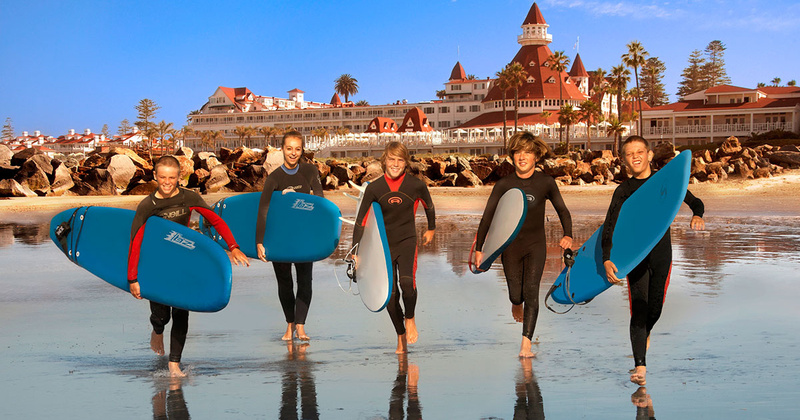 From here, you can quickly get to some of California’s best beaches. My favorites: Goleta Beach Park, right next to the University of California, Santa Barbara, campus. Walk out on the pier for a terrific view and you might see a shark or two, like we did. And Jalama Beach County Park, a 45-minute drive from Buellton on mountain roads that twist and turn their way to an abrupt end. If you go, you have to try the famous Jalama Burger at the General Store. To get a better view, you have to get higher. We headed over to nearby Los Olivos for a hot air balloon ride with Sky’s The Limit, a regional operator. We’d seen their balloons flying over the wineries in Temecula, Calif., when we visited a few weeks before, and were dying of curiosity. What’s up there? On an early morning flight, we found out. Wineries, a bird’s-eye view of the beach, and Michael Jackson’s Neverland Ranch. Yes, this is where the Gloved One came to get away from Los Angeles. Solvang is worth a look, and you’ll find a few good restaurants and a lot of great pictures there, but if you’re coming here it isn’t the main attraction. To really experience the northern part of Southern California — or as some call it, Central California — you have to get out. Head to the mountains or the beaches, and push the boundaries a little. Or, to borrow a word the Buelltonites like to use, go sideways. In Buellton, the Sideways Inn is a fun, authentic experience. 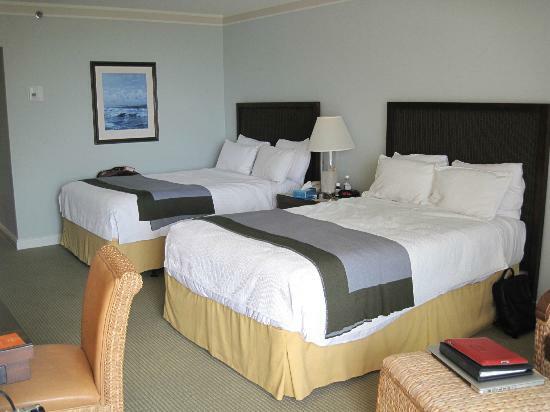 It has a nice pool, and breakfast is included in the room rate. The nearby Santa Ynez Valley Marriottcaters to more of a business travel crowd and has an excellent on-site restaurant, which makes really good salad and sandwiches. For breakfast, head over to Ellen’s Danish Pancake House (805) 688-5312 for the Danish pancakes. They’re oversize, thin, and not too sweet; you will want to order another plate. Go to Bacon & Brine in Solvang for lunch and order anything with a pickle. The pickles ruly are one-of-a-kind. Try the Hitching Post II for dinner. The artichokes there are amazing, and the steaks are cooked to perfection. You mean, apart from ballooning and visiting the beach? How about picking fruit? We had a fun afternoon harvesting delicious blueberries at Santa Barbara Blueberries. The hiking opportunities here are also extensive. You can find more on hiking and other outdoor activities at the Visit Buellton site.